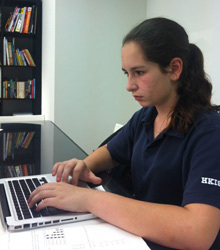 Writing Enrichment is a highly intensive program designed for students age 12-16 to further develop their critical reading & writing techniques, and range of vocabulary. In parallel to sharpening their writing skills in fun and challenging ways, students also learn relevant current event issues that will deepen their insight into their local community and world. In an intimate classroom setting, students will receive individualized supervision and feedback and produce multiple drafts to perfect their final masterpiece! This can better prepare them for any standardized tests, and to become stronger writers in high school and college.